If you ever bird around Georgia coast (click link to see hot birding sites along the coast), Gould's Inlet (a birding hot spot) is a must visit place. A sandbar extends from Sea Island beach all the way to the inlet creates a unique place for birds to stop and forage. It's not easy to find this tiny spot. But if you do find it, it will definitely be an unforgettable birding experience. No matter during high or low tide, you can always find something interesting here. It was a pleasant and breezy morning when I arrived at Gould's Inlet and it was high tide so I decided to check marshy area off Ocean Rd and planned to return when tide descended. The first lifer I got was seeing 8 Whimbrels and photographed a beautiful Tricolored Heron! When I returned, I ran into few birding friends and we had a great time birding together. Among 54 species we observed in 3 hours, 5 species of terns including Least Tern, Common Tern, Sandwich Tern, Forster's Tern and my favorite species, Loyal Tern and saw two Lesser Black-backed Gulls and recorded 4 dolphins jumping! After chasing shorebirds and Horseshoe Crab, on my way leaving Gould's Inlet, this chicken-sized bird caught my attention. Guess what I found? 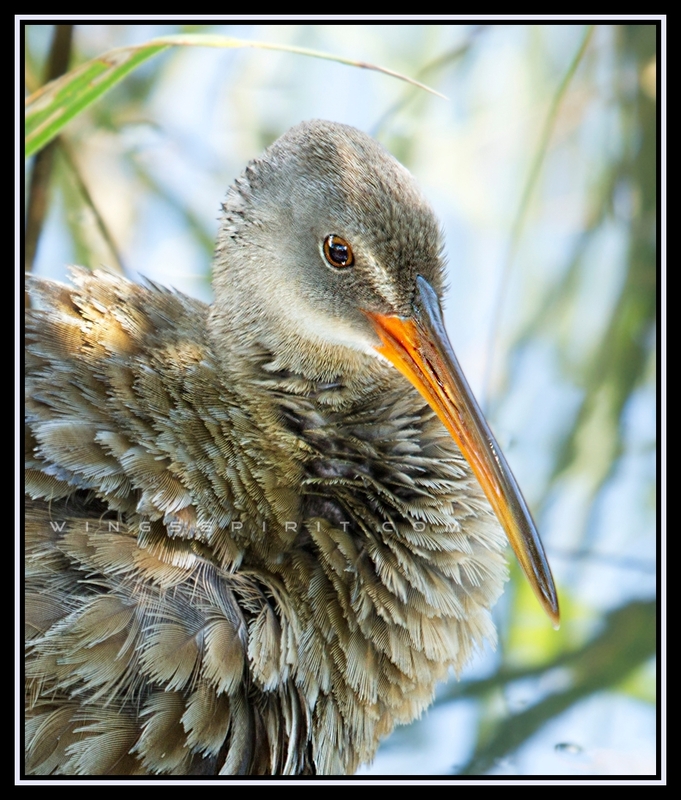 A Clapper Rail (Rallus longirostris)!! My birding friend told me Clapper Rails (click link to learn its facts) are very shy and they don't come close to human not to mention taking a close-up picture. Frankly, this rail did not seem to care I was there at all. Rails are abundant in wetland and marshes and they have adapted to blend themselves into the surroundings like rufous-colored King Rail and Virginia Rail or grayish Clapper Rail. One interesting fact is that rails don't usually abandon their nest when threatened and they use their bill to transfer young and eggs to a new nest. One of the very best photos of this bird I have seen---superb clarity and detail as well as the 'catchlight' in the eye!!!! You should enter this in next year's AAS photo contest!!! !